Virgin Galactic’s George Whiteside and Richard Branson speak with the news media. Image: Virgin Galactic. Richard Branson, the charismatic leader of Virgin Galactic and a driving force in the push to commercialize space travel, vowed Saturday to find out what caused the fatal crash of his company’s SpaceShipTwo rocket plane Friday, to learn from the tragedy and to press ahead with plans to carry paying customers into space. The normally confident Branson was even more circumspect when asked if the dream of commercial spaceflight is still alive in the wake of the high-profile crash. SpaceShipTwo, a futuristic looking winged craft with a striking Virgin Galactic logo and livery, was designed to carry passengers out of the discernible atmosphere for brief forays in the weightless environment of space. It was built by Scaled Composites, a company founded by legendary aerospace designer Burt Rutan whose smaller SpaceShipOne became the first privately funded vehicle to fly into space in 2004. Carried to an altitude of about 50,000 feet by a twin-fuselage jet, SpaceShipTwo is released for a short freefall before a hybrid rocket motor ignites, burning solid and liquid propellants to boost the spacecraft out of the dense lower atmosphere. Rocketing to an altitude of more than 100 kilometers, or about 62 miles — the generally agreed-on boundary of space — passengers will experience several minutes of weightlessness, along with an out-of-this-world view, during an arcing trajectory back into the atmosphere for the long glide back to Earth. Hundreds of well-heeled customers have made down payments or paid full price for tickets costing $250,000 each in hopes of becoming private citizen-astronauts. Test flights were aimed at paving the way for the start of commercial operations next spring. 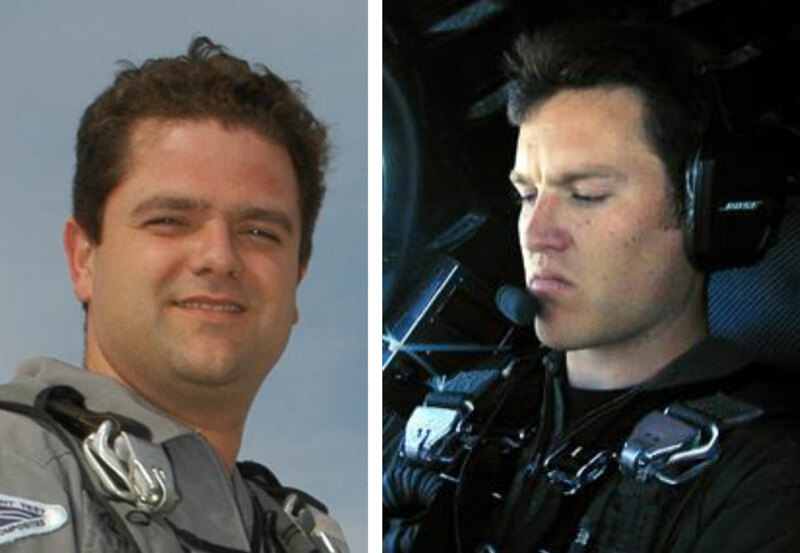 Pilot Peter Siebold survived the accident (left) but co-pilot Michael Alsbury (right) was killed. Image: Scaled Composites. But during a test flight Friday, SpaceShipTwo suffered a catastrophic break up. Co-pilot Michael Alsbury, a 39-year-old veteran of eight previous flights aboard SpaceShipTwo, was killed in the mishap. The pilot, identified later Saturday as Peter Siebold, director of flight operations for Scaled Composites, survived a parachute descent and was transported to an area hospital with unspecified injuries. Friday’s test was the first powered flight of SpaceShipTwo since January and the first flight using a hybrid rocket motor with a different fuel mixture intended to improve performance. The mishap occurred a few seconds after motor ignition when the spaceplane suddenly broke apart in a cloud of debris, raining wreckage across a wide area. 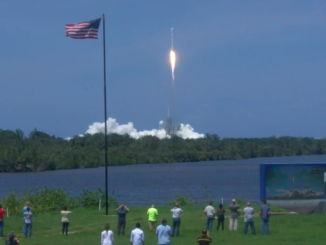 It was the second rocket-related failure in three days. An Orbital Sciences Antares booster making only its fifth flight exploded in a spectacular fireball 15 seconds after launch from Virginia Tuesday, destroying an unpiloted cargo ship bound for the International Space Station. 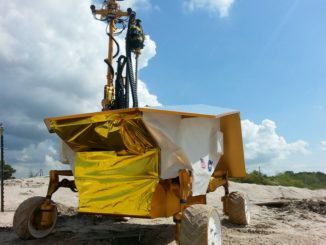 The flight was carried out under a commercially-structured contract with NASA. Virgin Galactic pilot Todd Ericson, left, looks over wreckage from the SpaceShipTwo rocket plane with NTSB investigator Joe Sedor. Image: NTSB. With Federal Aviation Administration concurrence, Orbital Sciences is leading the investigation into the Antares failure. 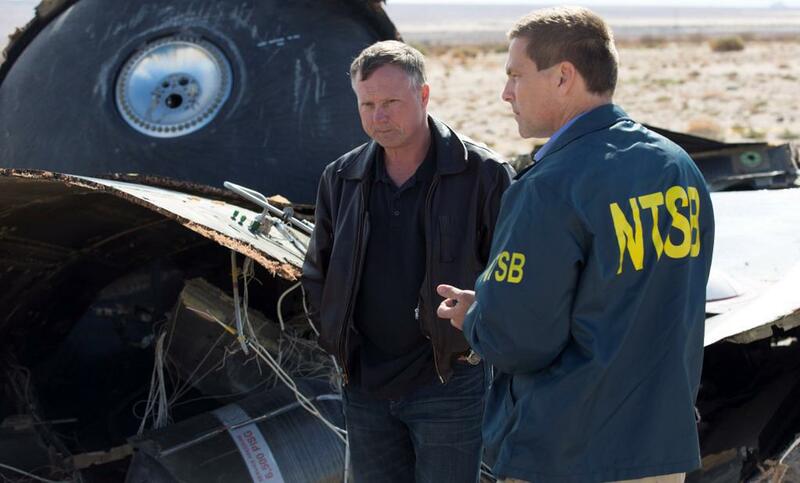 But a team from the National Transportation Safety Board, led by senior investigator Lorenda Ward, is in charge of the SpaceShipTwo accident investigation. During a brief news conference Saturday night, NTSB Acting Director Christopher Hart said the wreckage was spread out over five miles, indicating an in-flight breakup. The plane’s tail fins were found at one end of the debris field, then the main body of the fuselage with the rocket motor’s propellant tanks, then the cockpit and finally, the hybrid rocket motor itself. Because SpaceShipTwo was making a test flight, investigators will be able to study video from multiple cameras as well as data from more than 1,000 channels of telemetry. 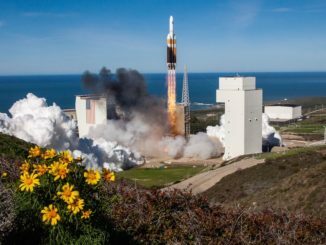 Hart said the spacecraft was equipped with six on-board cameras and six “non-volatile” data sources. In addition, three cameras were aboard the WhiteKnightTwo carrier plane, a long-range tracker at nearby Edwards Air Force Base was focused on the spaceplane and a chase plane carried a camera and radar. Siebold has not yet been interviewed and Hart said he did not know how the pilot managed to make it out of the disintegrating aircraft for a parachute descent while Alsbury did not. He said the on-site phase of the investigation likely would last four to seven days, followed by detailed analysis. The overall investigation could take a year to complete. 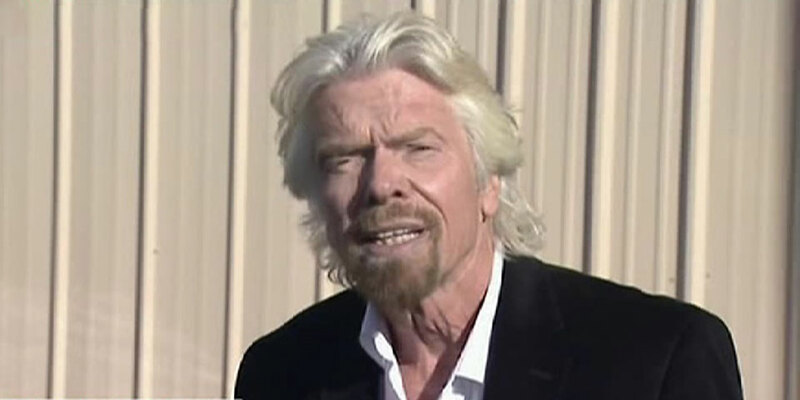 Richard Branson speaks to the press about the Virgin Galactic accident. 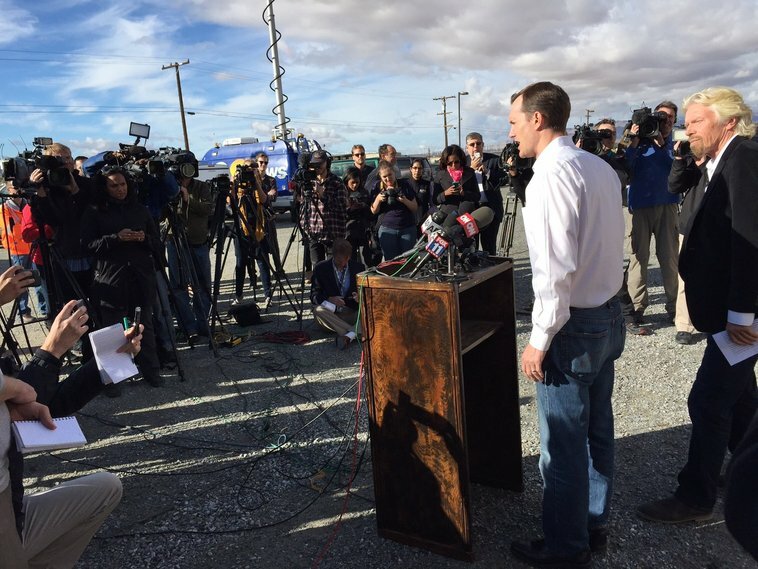 Earlier in the day, Branson briefly spoke with reporters at the Mojave Air and Space Port where Scaled Composites is based, delivering a somber statement praising the SpaceShipTwo test pilots and offering condolences and support to their families. Quoting a note from Canadian astronaut Chris Hadfield, Branson said pushing boundaries always carries risk. Asked about the response of Virgin’s customers, Branson said many have expressed support including one who signed up in the wake of the accident.